The pair cannot determine movement direction. The pair GBP/USD has been declining for a few days and at the same time experiencing long-term upward corrections. Yesterday the British currency weakened amid negative data on the retail price index and indices of transfer and consumer prices in the UK. The pair fell to the level of 1.6220, however at the end of the trading day it regained 50 points and consolidated at the level of 1.6300. The key event of today is the decision on QE3 program by the US Fed. If the regulator makes changes in the monetary policy, demand for the American currency will rise sharply; however it is not expected that the pair will fall drastically. 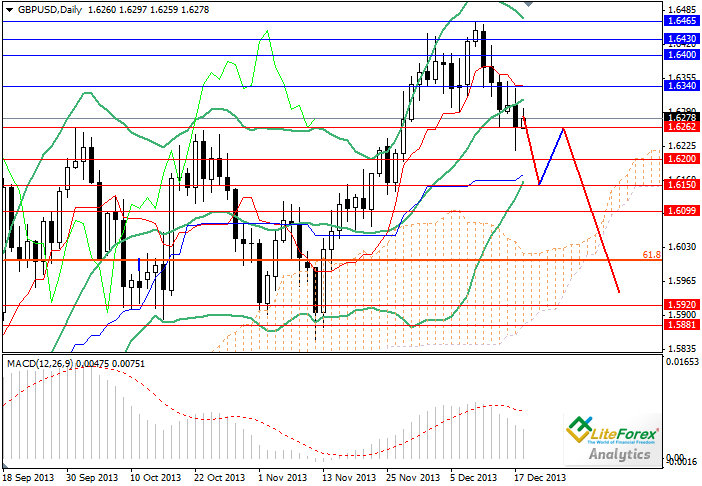 It is likely that the pair will gradually decline to the targets of 1.5880, 1.5440 and 1.5300. Plus to the American news the data on the British labour market is also expected. Today the pair GBP/USD will trade in the wide sideways channel. The US economic statistics give cause to open short positions and wait for the long-term decline in the pair. However, we should not forget that Ben Bernanke and Janet Yellen are strong supporters of soft monetary policy. So, red rug for the bulls or sweet honey for the bears? We will know the answer in the nearest future. Support levels: 1.6260, 1.6200, 1.6100, 1.5880 and 1.5750. Resistance levels: 1.6340, 1.6400 and 1.6465. In the current situation it is recommended to place short positions with profit taking at the level of 1.5880.